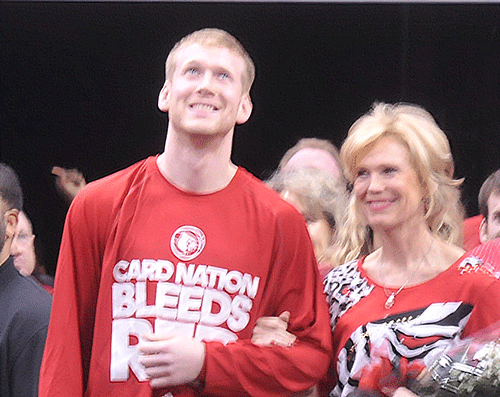 Luke Hancock is escorted by family and friends for his final game. 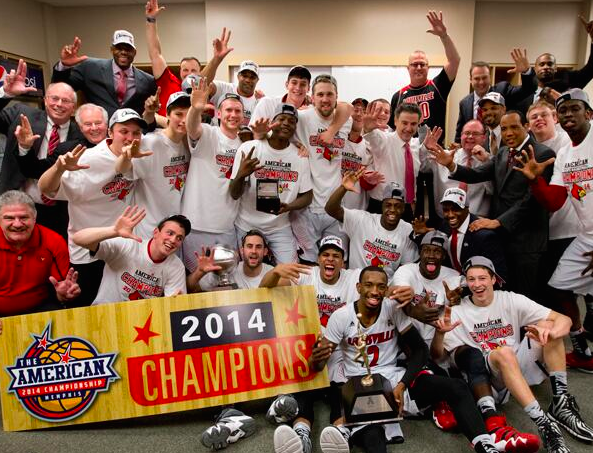 Hard to imagine University of Louisville basketball without some of the players who competed for the last time at the KFC Yum! Center in Cardinal uniforms Saturday. 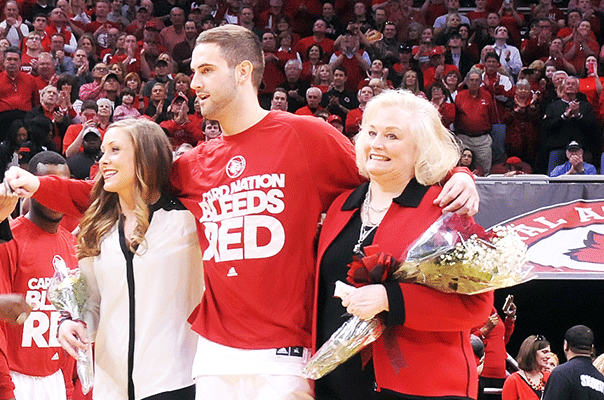 Four of them — Russ Smith, Luke Hancock, Stephan Van Treese and Tim Henderson — playing their last home game as seniors, having compiled so many memories, so many accomplishments, the winningest class in UofL history, including two Final Fours and a national championship. Providing the leadership for a team that just may putting the pieces together for another memorable run. Montrezl Harrell, just a sophomore but a co-captain, inevitably putting his name in the NBA draft, fitting in perfectly with his older teammates, bringing so much so quickly for a team that badly needed his enthusiasm and skill set. Big game, emotions running rampant, with the kind of distractions that often affect individual focus and collective composure. Sometimes manifested in overpowering starts and big leads, often fizzling as the game wears on. Like when Louisville jumps out to an early 17-5 lead before a dry spell allowing UConn to cut the margin to eight with three minutes to go in the first half. UofL’s shooting may have cooled off briefly but not its defensive effort, not allowing UConn’s Shabazz Napier or Ryan Boatright to collect a single field goal in the first half. They would wind up with only nine and six points, respectively while managing only three assists and turning the ball over nine times. Russ Smith, playing in front of several of his high school teammates from New York in the crowd, showing he’s much more than a shooter now, making a rare start at point guard and racking up a career high 13 assists while making four steals. Russ would, believe it or not, take only two field goal attempts, winding up with only three points in the game. Luke Hancock’s three-point shot has never looked better (except in the NCAA championship game). He would hit four of them in a game for the fifth time this season. Montrezl Harrell knows when to pounce, again looking almost unstoppable, with his 20 points — half of them from dunks — and 13 rebounds, his eighth double-double this season. Stephan Van Treese, who demonstrated a pretty impressive post move for the first time ever, would also pull down 13 rebounds. Keep working on that post move, Stephan, a secret weapon could come in handy the next two or three weeks. An impressive performance 81-48 win over UConn on Senior Day, Louisville wrapping up the regular season with a 26-5 won-lost record. These players have been through a lot in the past four seasons and they’re not ready to say goodbye any time soon. 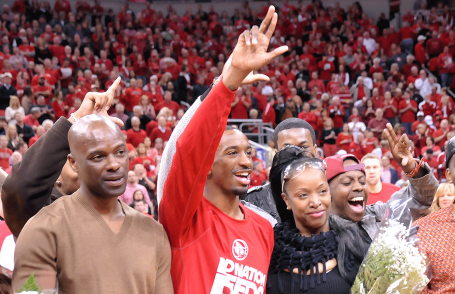 Russ Smith with his dad (left) and other family members. 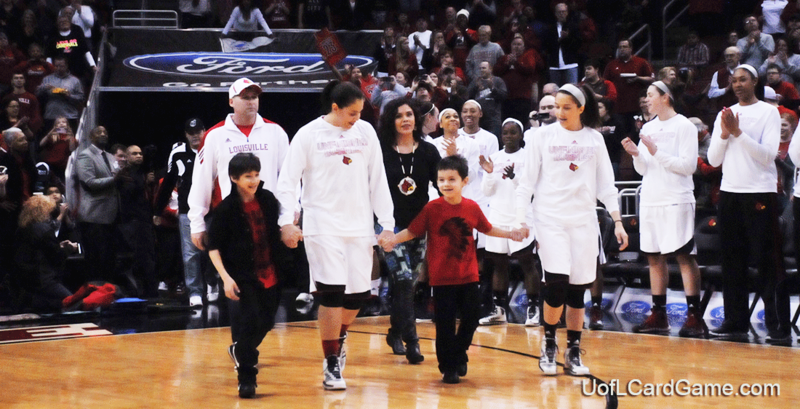 The Schimmel Family approaches center court for Senior Night ceremonies. A beautiful night at the KFC Yum! Center, all the pieces in place for a milestone in the evolution of the University of Louisville women’s basketball team.A record crowd, with 22,163 fans packing the three levels of the arena. Hundreds of Native Americans, in all manner of custom dress, dozens of them opting for Louisville T-shirts. At least 1,500 of them from 40 different states, some driving between 800 and 1,000 miles to honor Shoni and Jude Schimmel. Many of them declaring the Schimmel girls heroes, setting an example for their sisters across the country. Senior Night honoring Shoni, Tia Gibbs, Antonita Slaughter, and Asia Taylor, members of the winningest women’s team in UofL. Each of them having overcome unique challenges, wanting to reverse the trend against the juggernaut known as UConn, a team UofL hadn’t defeated since 1993. They would jump out of the gate, Asia Taylor good for a jump shot, Shoni with a three-pointer and Sara Hammond with another jumper, the Cardinals out to a 7-0 start, and managed to hold a 16-13 lead at the 14:13 mark. Asia would not score again and Shoni would not hit another three-pointer the rest of the game. The Huskies trailed just three more times after that before an all-too-familiar run for a 12-point lead at the half. The faster taller, stronger UConn team would out-rebound Louisville 47-30, block eight shots, and turn the Cardinals over 16 times, promptly answering anything resembling a challenge, and finish the regular season with a perfect 31-0 record. Tia Gibbs led UofL scoring with 16 points, including three three-pointers. Hammond and Shoni Schimmel added 12 and nine points, respectively. The Cardinals finished with a 28-3 mark. UofL has made progress against UConn in the past eight years, but UConn just keeps getting better, continuing to raise the bar for the Cardinals. On November 11, 2010, the University of Louisville women’s basketball team played its first game at the KFC Yum! Center. The opening game of the season. Packed house, with 22,124 fans. Angel McCoughtry’s jersey would be retired that night, two seasons after leading UofL to the national championship game. Things had gone downhill the previous year, multiple injuries and 14-18 won-lost record. These Cardinals needed a boost. 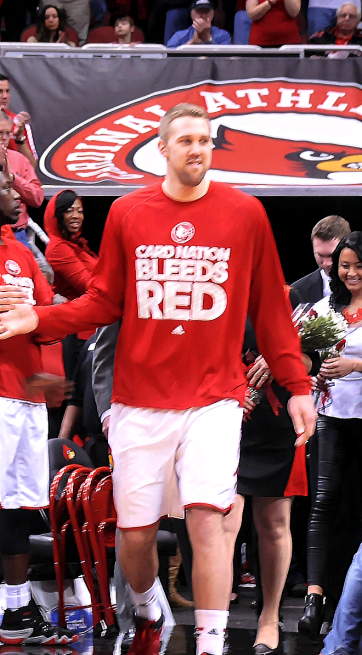 The night would begin a new era, not only in facilities, but because it would be Shoni Schimmel’s first ever as a Louisville Cardinal. 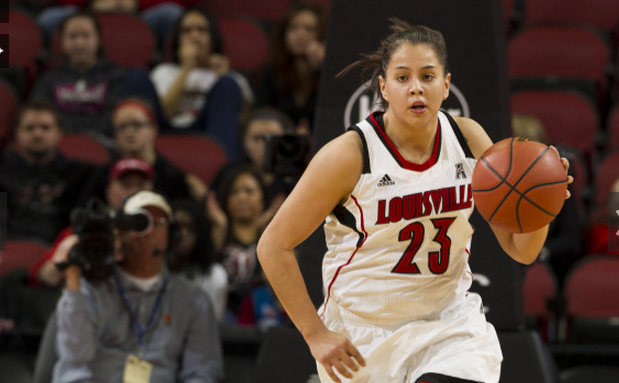 A Native American phenom from Mission, Oregon, one of the few freshmen to ever start in her very first game at UofL. Not a pretty start. Her first seven passes were way wide of their targets — eight turnovers in the first half, no points, no assists during those first 20 minutes. She would recover somewhat during the second half, committing only one turnover while making three assists scoring nine points (including her first three-pointer) in a 63-50 loss to Tennessee. Over the next four seasons, she would score 2,027 points to rank second behind only McCoughtry in the program, become the all-time UofL leader with a total of 366 three-pointers, and be credited with 569 assists. She also has led her team to three NCAA appearances, including the national championship game last season. Anything and everything, mostly good, can happen when Shoni Schimmel gets the ball. Just ask her teammates, the recipients of her no-look passes, forcing them to be ever alert. Against Memphis earlier this season, she hit eight straight three-point shots, totaling nine for the game. Four years and 135 games later, Shoni will be appearing in her final regular season home game Monday night against top-ranked and undefeated UConn. It’s Senior Night for Shoni and three teammates — Tia Gibbs, Antonita Slaughter and Tia Gibbs — and they have reason to believe anything is possible.